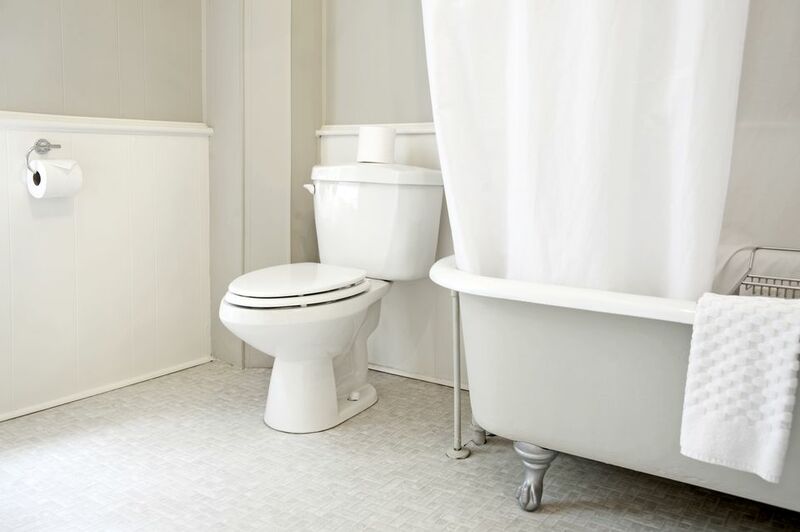 A loose toilet seat is a common problem caused by the constant opening, closing, and sitting that eventually loosens the bolts securing the seat to the body of the toilet. As DIY home repair projects go, it is about as easy as it comes—all that's required, usually, is a screwdriver. On rare occasion, you might need pliers, a ratchet wrench with a deep socket, an adjustable wrench, or a specialty tool that comes with a toilet seat tightening kit (see below). Some toilet seat bolts are exposed, but most just have a plastic flap that snaps closed to cover them. Use a screwdriver to pry these plastic covers open to expose the bolts that secure the seat to the top of the toilet bowl. If the bolts have slotted heads, then tighten them by turning clockwise with a screwdriver until they are tight. If the bolt just spins without tightening, then use pliers to grip the nut threaded onto the mounting bolt from below the toilet as you tighten the bolt from above with a screwdriver. Most toilets seats use steel screws, but on cheaper seats with plastic bolts, be careful not to break the bolts or strip the threads. If necessary, you can tighten the mounting nut from underneath. From under the bowl, turn the toilet seat nuts clockwise until they are tight. A ratchet wrench with a deep socket is usually the easiest way to tighten these bolts, but an adjustable wrench can also be used. Note: If the toilet seat bolts break or refuse to tighten, you can purchase replacement bolts at a hardware or home improvement store. Bolts that are frozen may have to be cut off with a hacksaw blade. Use only the blade (not the hacksaw), because it is very thin and it will fit under the head of the bolt; it can usually cut the bolt without scraping the porcelain on the bowl. There are also short-handle, or mini-hacksaws that are a good choice for working in tight spaces. However, if the seat itself is in poor condition, this is a good time to purchase and install a new seat. Also available at home improvement centers and online retailers are several versions of a toilet seat tightening kit. The kits include rubbers washers that fit under the bolts to remove extra space that causes the seat to wiggle. A small specialty wrench that will fit most mounting nuts is also included. Remove the nuts from the mounting bolts and slip the rubber washers onto the bolts from underneath the toilet bowl. Loosely thread the nuts back onto the bolts. Carefully aligned the seat, then tighten the nuts fully by hand. Use the specialty tool to tighten the bolts another 1/4 turn to make sure it is snug.